Nearly two years in the making, the Community Rejuvenation Project (CRP)’s Alice St. Mural recently completed Phase II of its production. 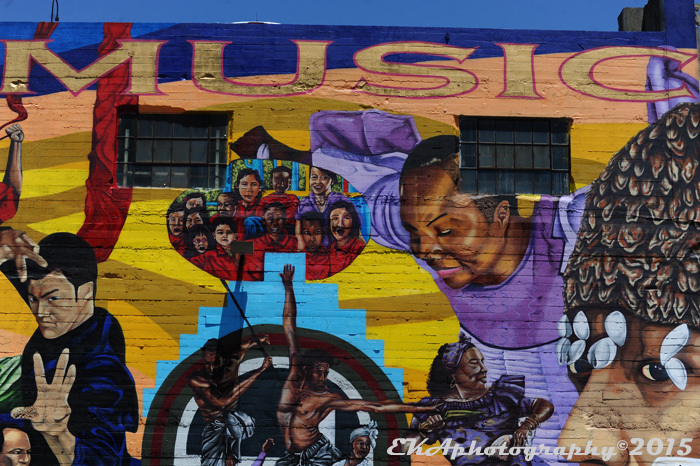 The massive wall prominently features figures of cultural importance in the history of the Alice Arts Center/Malonga Center for the Arts, as well as Filipino dancers and onetime Oakland Chinatown resident and kung-fu icon Bruce Lee (representing the Hotel Oakland’s Chinese-language constituency).This fourth and final wall finishes the transformation of a blighted parking lot littered with graffiti tags and seemingly impervious to abatement efforts into a neighborhood landmark and source of civic pride. Phase II adds cultural pioneers and legends Jose Lorenzo, Carlos Aceituno, CK Ladzepo, Mosheh Milon, Tacuma King, Papa Zak Diouf, Naomi Diouf, Ruth Beckford, and Halifu Osumare, as well as dancers from Dimensions Dance Theater and children from Starlite Children’s Center, to the visual art project, joining such luminaries as Malonga Casquelord, Carla Service, Jerri Lange, Chauncey Bailey, Roy Chan, Kahlil Shaheed, Destiny Muhammad, AXIS Dance Company, Cephus Jonson, and the Chinese lion and dragon dancers rendered in Phase I. A fitting coda to the project came when longtime neighborhood resident and project supporter Michael Lange, who recently passed away due to illness, was painted into the last remaining open space on Phase I’s centerpiece wall. 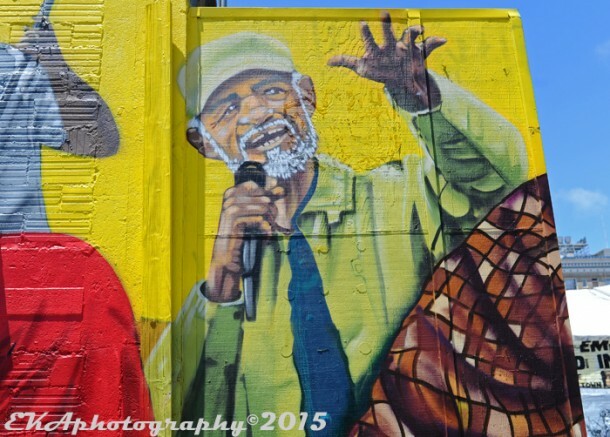 A block party scheduled for Saturday, June 6, 12-4pm, in the parking lot at Alice and 14th Sts., will officially commemorate and dedicate this mural with a community celebration featuring guest speakers and live music and dance. 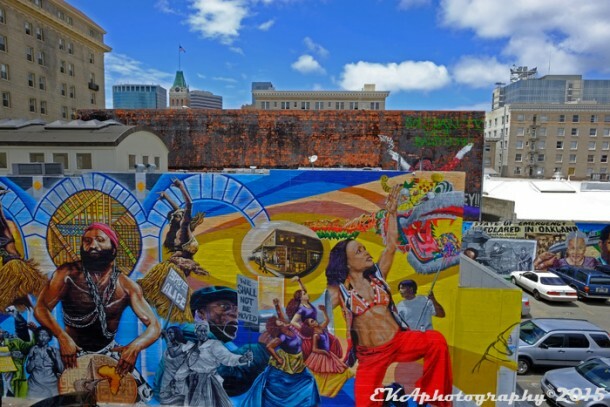 Scheduled performers – many of whom are among the Oakland arts pioneers painted on the wall – include Oaktown Jazz Workshop, Kiazi Malonga, Mosheh Milon, Tacuma King, Diamano Coura, Dance-A-Vision, Fogo Na Roupa, SambaFunk, PE 2.0, and the Hotel Oakland Choir and Dancers. Guest speakers include District 3 Councilmember Lynnette Gibson-McElhaney, Alice Arts Center co-founder Halifu Osumare, media personality and author Jerri Lange, and Gerald Reese. The event will begin with an Ohlone prayer and song by Luta Candelaria, and will be hosted by Carla Service. 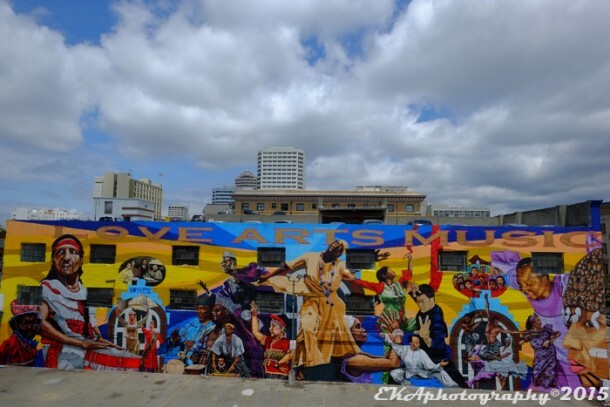 Neighborhood residents, public art advocates, supporters of murals, beautification lovers, and community media are all encouraged to attend the official unveiling and dedication of this historic project, funded with contributions from the City of Oakland’s Cultural Arts Program, Akonadi Foundation, former mayor Jean Quan, the Hotel Oakland, Council District D3, East Bay Community Foundation, Zellerbach Family Foundation, and an Indiegogo crowdfunding campaign. Upcoming projects associated with the Alice St. Mural Project include a documentary containing interviews, rare historical footage and a behind-the-scenes look at the making of the mural directed by Spencer Wilkinson; an educational website with detailed background information on every character and image on the wall; and a coffee table book to be written by CRP Communications Director Eric Arnold and published by Pochino Press. For more information, contact CRP at: crpbayarea [at] gmail [dot] com.